Jan Luyken's illustration of the rapture described in Matthew 24:40, as found in the Bowyer Bible. In Christian eschatology, the post-tribulation rapture doctrine is the belief in a combined resurrection and rapture (e.g., resurrection-rapture) of all believers coming after the Great Tribulation. This doctrine holds that there is a resurrection of dead believers and rapture or translation (or a taking-up/catching-away) of living believers in Jesus Christ at the end of the age (or the "End time"). Post-tribulationists believe that Christians will remain on the Earth throughout a whole 7-year Tribulation period which includes the last three and a half years which some differentiate by calling the last three and a half years the Great Tribulation period. The main and distinguishing feature of Post-Tribulationalism is that it holds that the Rapture will occur after a 7-year Tribulation period and not before it as in Pre-tribulationism or after 3 1⁄2 years as in Mid-Tribulationalism. This period starts at the Abomination of Desolation and ends at the Battle of Armageddon. They will be taken up (or raptured) to meet Christ in the air (raptured) at the Christ's second coming immediately after the great tribulation just before the battle of Armageddon and then return with Him as Christ descends to the Earth, to usher in the Millennium—the 1000-year reign of Christ on Earth]. This is usually understood as being in line with Historic Premillennialism. For additional references, see also the parallel passages from Mark 13:24-27 and Luke 21:20-28. While the passages in Luke 21 parallels Matthew and Mark, it offers a couple of interesting clarifications. This passage in Luke offers interesting references to some of the major events which are greatly elaborated on in the Book of Revelation. Reading all three Books of the Bible in parallel, it would appear that Luke elaborates on the "abomination of desolation" describing Jerusalem being surrounded by the armies of the world and of Jerusalem's imminent destruction (Luke 21:20). Another account which lends support to the idea of a post-tribulation rapture is in 2 Peter 3:10-13, where the idea of the "Day of the Lord" coming as a "thief in the night" comes from. This idea of imminence, according to the post-tribulation view, only applies to the wicked and the spiritually unprepared people that are still alive before the Return of Christ. Therefore, only God's elect (Christians) will fully have a clear understanding of the timing of the second coming, and therefore Christ's coming will not catch the believers by surprise, but only those who are spiritually ignorant regarding the truth. In the passage of 2 Peter 3:10-13, Christ's return is equated with the "elements being melted", and "the earth also and the works therein shall be burned up". Opposing views are not non-existent within the realm of Christian Eschatology. Two opposing views, pre-tribulationism and mid-tribulationism, see the rapture and the Second Coming (or Greek, paraousia) of Christ as separate events; while in post-tribulationism the two events are identical or simultaneous. The belief is that God's Elect from all ages will be translated from mortal bodies into immortal glorified bodies at the Second Coming of Christ and that this will be at the end of the age. This event, it is believed, will come at the conclusion of what is termed the 70th Week of Daniel, the final seven years of this present age. This view was held by the early Church Fathers and has been held by Christians since that time. The doctrine of the post-tribulation rapture is today held by a growing number of evangelical Christians. For post-tribulationists concerned about the recent decline of Christian faith, doctrine, and morals in the western church, an important reason to advance the post-tribulation rapture doctrine relates to the importance of preparation of believers for "witness under trial". Another idea is that following the Great Tribulation, the False Prophet, or the "beast out of the earth" and the Antichrist or the "beast out of the sea" will be condemned upon Jesus Christ's return, and all those who endured or died for Christ's return will be raptured to heaven and, following the Millennium, Satan will be condemned and the remaining dead believers will be raised and raptured into the new heaven. Post-tribulationists broadly base their doctrine on the complementary concepts that a two-phase pre-tribulation rapture is never mentioned explicitly in the Bible, and that the "whole counsel of Scripture" seems to clearly teach that the resurrection and rapture of the Church will be the result of the visible, physical Second Coming of Jesus Christ to Earth and that Christians are to look and watch for that event. Matthew 24:29-31 and 1 Thessalonians 4:15-17 both mention the same individuals (Jesus, his angels) and the same events (Jesus coming, the trumpet of God, and the gathering of the elect) in the same order. The latter passage written by the Apostle Paul is seen as being based on the former because of the usage of "by the word of the Lord" in verse 15 and that they are talking about the same event, but the first passage is explicitly dated "after the Tribulation", and the second is where we get the term Rapture. Contrasting opinion maintains that the passages are not talking about the same event despite some similarities because of details that are absent between the two passages and that the rapture event was a "mystery" until it was revealed in First Corinthians which the Thessalonian recipients would have been unaware of. Some post-tribulationalists see the rapture and the Second Coming of Christ as part of one main event. Support for this claim is found in 2 Thessalonians 2:1-3 in part because of the way the Apostle Paul introduces his topic, "Now concerning the coming of our Lord and our gathering together with him." This was an ancient way of introducing your topic of discussion and later Paul refers back to the two nouns at least twice as "the Day of the Lord" or "that day." Thus, "the coming" and "gathering" seem to be two ways of referring to one event, "the day of the Lord." 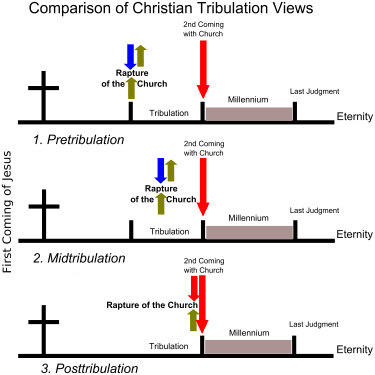 It seems impractical for Paul to go to great lengths describing the coming of the Antichrist (and the falling away) to the Thessalonians in order to calm them down that the day of Christ's reign on earth had not happened yet if they were not going to be there for it as maintained by the pre-tribulational position. He would be more comforting by reminding them that they wouldn't be present for it than to precisely detail his recognition and say "Don't let anyone deceive you in any way, for that day will not come until the rebellion occurs and the man of lawlessness is revealed, the man doomed to destruction". The most common passage used in defending a pre-tribulational position is 1 Thessalonians 4. This passage alone does not mention where the gathered ones finally end up but that those who are alive will be caught up to meet Christ in the air and always be with the Lord. Rather it mentions the dead rising, Christ's coming, angels, the trumpet of God along with the gathering of the elect and all of these participants are present in Matthew 24:30-31, which is clearly a Second Coming passage even agreed to by pre-tribulationalists. The author, the Apostle Paul says the rapture will occur "at the last trumpet". To be consistent with Revelation 11 this trumpet call must occur after the Tribulation. In the same way, Revelation 21 mentions the first resurrection after the Second Coming in Revelation 19. By definition, there can be no trumpet call after the last one, and no resurrection before the first. Linguistic support for a one-event Second Coming are in the words "meet" and "coming" in 1 Thessalonians 4. The meet in 1 Thessalonians 4:17 and in Matthew 25:1 (a Second Coming parable) refers to the custom of people going out to meet a dignitary as he was approaching their city before he got there, and accompanying or welcoming him back to where they came from. This is also the usage in Acts 28:15 of those going out to meet Paul as he headed toward them in Rome. Also, the Greek term parousia has the idea of a grand dignitary making his arrival to a certain location. The rest of the passage supports this grand arrival with His coming being heralded with trumpet, angels, and a surging 'city' of gathered believers going out to meet Him. Who more grand than the Lord Jesus Christ at His coming to reign on earth? This passage lends more weight to the post-tribulational position. A passage much debated regarding the timing of the rapture is Revelation 3:10, which speaks of the Philadelphian church being "kept from the hour of trial which is about to come upon the whole earth to test those who dwell on the earth." The debate centers around the phrase "kept from" which could be taken to mean "physical removal from" (Pre-trib) or "preservation from or in the midst of" (Post-trib). However it is interesting to note that the verse denotes that the testing is for "those who dwell on the earth." This is a common phrase referring to unbelievers. Later in Revelation, on at least 3 occasions, the saints are "sealed" and kept out of harm's way when God pours out specific judgments which only affect His unbelieving enemies. The pretribulational argument that there are 'two phases' to Christ's coming (a rapture and a later Second Advent) runs into difficulties with Acts 1:11, which nearly equates Christ's Ascension to heaven with his Second Coming. Logically, the Second Coming cannot have two phases if the Ascension only had one. This eliminates two phases of His Coming with a 7-year interval. Likewise, heaven must "receive" or contain Jesus "until the period of restoration of all things about which God spoke by the mouth of His holy prophets from ancient time". Most scholars see this "restoration of all things" as the one-thousand year reign of Christ on earth (as prophesied in the Old Testament) which begins just after the Second Advent. If Christ is to remain in heaven until this coming rule of His according to thess verses (see also Hebrews 9:27,28), it would seem the next main prophetic event would be the Second Coming rather than Him coming 7 years prior to get the church, bring them back to heaven, and then leaving heaven for earth again as the pre-tribulational rapture position indicates. Pre-tribulational usage of Luke 17 can also be counterbalanced. In this eschatological scenario, Luke 17:37 explains what happens to the people that are "taken": the eagles gather together at their [dead] bodies. Do they eat them? "Taken" may also have the idea of judgment and that Luke 17:22-37 is referring to the unmistakable visual nature of the Second Coming. Even the disciples are warned not to believe reports that Christ has come if they have not seen it "for just as the lightning, when it flashes out of one part of the sky, shines to the other part of the sky, so will the Son of Man be in His day. Many take the fact that vultures hovering over a dead body is clearly visible from a great distance away to mean that the Second Coming will be clearly visible and will not be hidden. It seems that Luke 17 can be compared to Revelation 19, which reads that the fowls are invited to a feast—on the flesh of men, small and great, at the Lord's coming. The Parable in Matthew 13 explains that the unsaved (tares) are destroyed first before the saved (wheat) are addressed. This parable describes what the kingdom of heaven is like and it uses agricultural metaphor to explain that believers and unbelievers will remain together until the harvest. When is the harvest? Well, when Jesus explains the parable. He says the harvest is the "end of the age" in verse 39. At that time he sends his angels to destroy the tares while the wheat (believers) remain and shine forth as the sun in His Father's kingdom. This seems to fit better with the rapture and the Second Coming being one event rather than a time gap of 7 years. Zechariah 14, speaks of the "Day of the Lord" and that "in that Day His feet will stand on the Mount of Olives." This exactly parallels the angel's statement in Acts 1, "that as He left so shall He return." Tying this with I Thessalonians, we see all the living and dead Christians are gathered to Jesus at that time. Going back to Zechariah 14:5 we read, "Then the LORD my God will come, and all the holy ones with him. " This inexorably links the return of Jesus to the glorification and "rapture" of Christians to Him. In Revelation 2:25 Jesus says to the faithful at Thyatira, "Nevertheless what you have, hold fast until I come." In other words, 'hold onto the truth of the Christian faith and its obedience amidst the false teaching of Jezebel and her sins, until My coming again.' Pre-trib commentators agree this could be talking about the Second Coming of Christ (John MacArthur, Robert L. Thomas). Would Jesus say hold on to the faith until I come again if they were not going to be there when he returned, but would have already been raptured? Expositor's Bible Commentary also makes this assertion. They are to be patient amidst persecution until when? Until the coming (parousia) of the Lord. Parousia is well known to mean "presence" and refers to His second coming many times in the New Testament. Also notice that the farming analogy seems to indicate that the farmer is aware of the coming rains just as the believer is aware of coming end time events. For example, Jesus warned "when you see these things begin to take place [end time signs in the sun, moon, and stars / world chaos], straighten up and lift up your heads, because your redemption is drawing near." This manner of expectancy is objected to on the grounds that it destroys the idea of Christ's rapture of the church being imminent, or able to occur at any moment. But imminent probably doesn't mean 'at any moment' in the New Testament. Many New Testament passages implicitly rule out an "any second" imminency (Matthew 24:45-51…25:5,19;Luke 19:11-27;John 21:18-19...Acts 9:15…). At the very least Apostles Peter and Paul could not have believed in this kind of imminency because Peter was told by Jesus what manner of death he was to die and that it would take place many years later. Jesus said, "Truly, truly, I say to you, when you were younger, you used to gird yourself, and walk wherever you wished; but when you grow old, you will stretch out your hands [be crucified], and someone else will gird you, and bring you where you do not wish to go." Could Peter think the rapture was at any moment with this enduring prediction by Jesus? Also, it was told of Paul that he would bear Christ's name "before the Gentiles and kings and the sons of Israel" and that God would "show him how much he is to suffer for My name's sake." Does an any-moment rapture fit with such a massive missionary plan revealed by God for Paul's life which took decades to complete? Jesus encouraged the first disciples and all Christians, to look for certain events which would indicate His coming was "at the doors." This coupled with other passages like 1 Thessalonians 5:2-6, seems to indicate moral watchfulness, waiting in expectancy, and sobriety ("be sober") and that the wrath of that day will overtake those in darkness (unbelievers) like a thief "but you, brethren, are not in darkness, that the day should overtake you like a thief." Thus a different concept of imminency emerges. Jesus, speaking chronologically in the Olivet Discourse regarding end time events, goes from the escalation of troubling times beginning in the 1st century and the present age (highlighting the destruction of Jerusalem by Rome in A.D. 70) to the time of tribulation and then to His Second Coming without any mention of a prior removal of the church 7 or 3.5 years before it. One author sees Jesus as advocating a "delay" between the destruction of Jerusalem and His Second Advent. On the contrary, he states that "immediately after the tribulation of those days…they [the world] shall see the son of Man coming…and He shall send His angels, and they shall gather His elect from the four winds, from one end of heaven to the other." Therefore, Jesus seems to put the rapture just before his second coming or on his way to earth. The phrase "gathering together" describes the rapture in 2 Thessalonians 2:1 using the noun form of the same Greek word. Paul says: "we who are alive and remain [on the earth] until the coming of the Lord, shall not precede those who have fallen asleep[died]." Then he points out that the Lord's coming with angels and the trumpet call will invite those already dead in Christ to rise from the dead before the ones on earth participate in the event. Then Paul states: "Then we who are alive and remain [on earth] shall be caught up together with them in the clouds to meet the Lord in the air, and thus we shall always be with the Lord." Some commentators note that because Paul used the plural "we" when referring to those who "are alive and remain[on earth]" indicates that Paul believed that he and all believers on earth might witness and be a part of the Second Coming of Christ from earth. This would indicate that he would be on earth just prior to the coming of the Lord and the rapture. This is also the usage when he speaks of the same event saying: "We shall not all sleep [die], but we shall all be changed-in a moment, in the twinkling of an eye, at the last trumpet. For the trumpet will sound, and the dead will be raised incorruptible, and we shall be changed." This passage adds the fact that believers will receive glorified bodies which is missing from the Thessalonian passage]." If believers were raptured before the tribulation then why would Paul use "we" and consider himself with all Christians to possibly be those who would be "alive and remaining [on earth] until the coming of the Lord?" They wouldn't be alive and remaining on the earth at His coming in a pre-tribulational scenario but would already be with Jesus in clouds along with the other believers who had died in Christ. Midtribulationists believe that the rapture of the faithful will occur halfway through the Tribulation, after it begins, and will endure the phase of the Tribulation which tests their faith, but that they will be removed before the last half occurs, because that 3 1⁄2-year period is manifestly dominated by the wrath of God falling on those who reject him, Supporters of this view often cite 1 Thessalonians 5.9, "For God has not destined us for wrath, but to obtain salvation through our Lord Jesus Christ." Augustine of Hippo, The City of God, Chapter 23. John Piper (Evangelical Calvinist, Pastor, Author) Article listed below. ↑ Hays, Daniel J. "Dictionary of Biblical Prophecy and End Times". pg. 208-209; 337-340. ISBN 978-0-310-25663-2. ↑ "Archived copy". Archived from the original on 2012-03-26. Retrieved 2011-06-24. ↑ "Is The Rapture Of The Church Imminent? Certainly Not!". Logosapostolic.org. Retrieved 2016-09-30. ↑ "1 Thessalonians 5:4 But you, brothers and sisters, are not in darkness so that this day should surprise you like a thief". Bible.cc. Retrieved 2016-09-30. ↑ Hoekema, Anthony A. The Bible and the Future. Wm. B. Eerdmans Publishing Company, p165, 1979. ↑ Anthony A. Hoekema, The Bible and the Future. Wm. B. Eerdmans Publishing Company, Grand Rapids, Michigan, p121, 1979. 1 2 Editors: G.J. Wenham, J.A. Motyer, D.A. Carson, and R.T. France. I. Howard Marshall commenting. New Bible Commentary. 21st century Edition. Inter-Varsity Press, p1283, 2004. ↑ MacArthur Jr., John F. The MacArthur Study Bible. Word Bibles, p.1848, 1997. ↑ "Archived copy". Archived from the original on 2007-09-27. Retrieved 2007-05-30. ↑ Martin, D. Michael. The New American Commentary: 1,2 Thessalonians. p.223,224. Broadman and Holman Publishers, vol. 33, 2002. 1 2 "Definitions and Observations Concerning the Second Coming of Christ". Desiring God. Retrieved 2016-09-30. ↑ Hubbard, David A. Editor: Everett F. Harrison. The New Testament and Wycliffe Bible Commentary, Moody Press, p 820, 1971. ↑ Gundry, Bob. First the Antichrist. Baker Books, p69, 1997. ↑ Gundry, Robert H. The Church and the Tribulation. Zondervan Publishing House, p54, 1973. ↑ Johnson, Alan F. The Expositor's Bible Commentary: Editor Frank E. Gaebelein. The Zondervan Corporation, Grand Rapids, Michigan, volume 12, p453, 1981. 1 2 Osborne, Grant R. Baker Evangelical Commentary of the New Testament: Revelation. Baker Academics, p 193, 2002. ↑ i.e "those who dwell on the earth." ↑ See Revelation 6:4, 6:8, 6:15, 6:17; 9:4; and 12:6, 12:14 for examples. ↑ Gundry, Robert H. The Church and the Tribulation. Zondervan Publishing House, p58, 1973. ↑ Anthony A. Hoekema, The Bible and the Future. Wm. B. Eerdmans Publishing Company, Grand Rapids, Michigan, p165, 1979. ↑ MacArthur Jr., John F. Why Every Calvinist Should be a Premillennialist - Part 1 biblebb.com/files/MAC/90-334.htm, 2007. ↑ Anthony A. Hoekema, The Bible and the Future. Wm. B. Eerdmans Publishing Company, Grand Rapids, Michigan, p20, 1979. ↑ Anthony A. Hoekema, The Bible and the Future. Wm. B. Eerdmans Publishing Company, Grand Rapids, Michigan, p190, 1979. ↑ Thomas, Robert L. An Exegetical Commentary: Revelation 1-7, Moody Press, p.231, 1992. ↑ Johnson, Alan F. The Expositor's Bible Commentary: Editor Frank E. Gaebelein. The Zondervan Corporation, volume 12, p. 46, 1981. ↑ MacArthur Jr., John F. The MacArthur New Testament Commentary: James. Moody Press, p. 253, 1998. ↑ Stanley N. Gundry and Gleason L. Archer Jr. Three Views on the Rapture. Zondervan, p208, 1996. ↑ Stanley N. Gundry and Gleason L. Archer Jr. Three Views on the Rapture. Zondervan, p207, 1996. ↑ Carson, D.A. The Expositor's Bible Commentary: Matthew, Mark, Luke. Editor Frank E. Gaebelein. Regency Reference Library, The Zondervan Corporation, Grand Rapids, Michigan, volume 8, p. 490, 1984. ↑ Stanley N. Gundry and Gleason L. Archer Jr. Three Views on the Rapture. Zondervan, p210, 1996. ↑ Ladd, George E. The Blessed Hope: A Biblical Study of the Second Advent and the Rapture. Wm. B Eerdmans Publishing, p.110, 1956. ↑ Carson, D.A. The Expositor's Bible Commentary: Matthew, Mark, Luke. Editor Frank E. Gaebelein. Regency Reference Library, The Zondervan Corporation, Grand Rapids, Michigan, volume 8, p. 495, 1984. ↑ "Vincent's Word Studies in the New Testament (NT) - 2Thessalonians 2". Godrules.net. 2006-12-19. Retrieved 2016-09-30. ↑ Harrison, Everett F. The Wycliffe Bible Commentary, Moody Press, p.819, 1971. ↑ Lindsey, Andrew. "Q&A on Post-tribulational Rapture w/ Dr. Albert Mohler". Call To Die. Retrieved 25 February 2015. ^ Koukl, Greg. The Rap on the Rapture: 1996. ^ Piper, John. Definition and Observations Concerning The Second Coming August 30, 1987. ^ Johnson, Alan F. The Expositor's Bible Commentary: Editor Frank E. Gaebelein. The Zondervan Corporation, Grand Rapids, Michigan, volume 12, 1981. ^ MacArthur Jr., John F. Why Every Calvinist Should be a Premillennialist - Part 1, 2007. Pentecost, J. Dwight, "Things To Come". Dunham Publishing Company, 1962.